We often review Shuttle barebones but still we don't manage to keep up with the sky-rocketing number of models from this company. It would obviously take much time and effort to review each of them, but actually this is not necessary: functionality is determined by a chipset and integrated controllers, you can read about chipset performance and features in our online reviews, and peculiarities of a given model are described on the web site of its manufacturer. What's much more important is the basis of a system – PC case, here you cannot do without individual analyses. Up to now we have reviewed models from the classic series, in G-series PC cases – G/G2/G4. Today we shall review a sample from the new generation of this series – G5, with considerably modified appearance and the improved internal arrangement. In the nearest future we'll try to get and review a model in a new general-purpose PC case (G series) or probably something from unique solutions (K, L, i). Thus, the key difference of G5 from its predecessors is evident: drive bays and interface connectors are now covered with caps. The 5-inch bay cover is traditionally spring-loaded so that it opens when the CD/DVD-drive tray ejects and automatically closes after a disk is loaded. The case is still made of aluminium (the front panel faceplate is plastic), this time it's black, the standard dimensions – 200x300x185 mm (WxDxH). It looks rather unusual but stylish, as all Shuttle models do (designers working in this company are full of pleasant surprises). 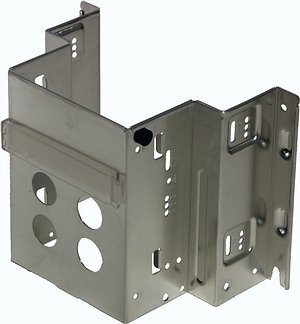 Many barebone manufacturers (for example, Soltek) have been using such front panel faceplates for a long time already. It's a nice solution, though tastes differ. Actually, Shuttle engineers have also come to this design (in the popular series of cases – P), but we have never reviewed such models on our site before. 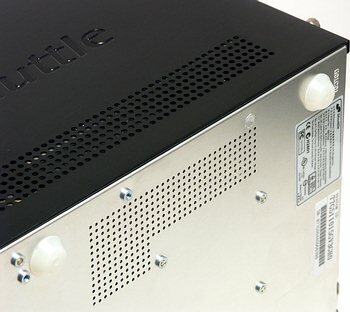 The PC case features vent holes not only at the sides of the case lid but on the bottom as well – the problem of cooling in modern solutions is critical. 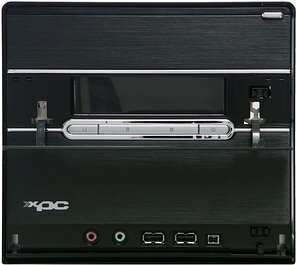 Covers on the 3-inch external bay and on the group of connectors on the front panel are opened manually; silvery power and reset buttons as well as power and HDD activity indicators are located between them. A set of interface connectors is typical for modern models: two standard audio jacks (microphone and headphones), 2 x USB (2.0), and 1 x mini-FireWire (4-pin, without power). They are all duplicated on the rear panel, which allows to use the front panel only for short-time connections (the case is not that attractive with open covers). As usual, to remove the lid from the SB77G5 case you just have to unscrew three wing nuts on the rear panel, another two screws to pull out the drive cage, and four latches hold the front panel. Thus, it will take several seconds to get a system ready for assemblage and upgrades, almost without a screwdriver. 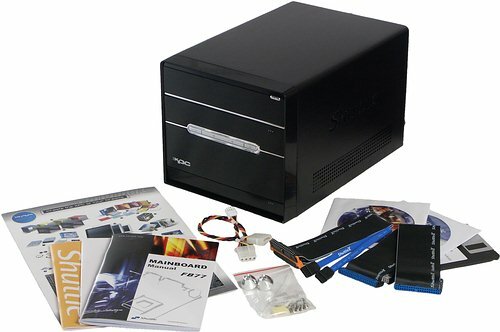 The drive cage is quite standard, it can easily accommodate two hard drives or a hard drive and a floppy drive. Then it should be put back into place to proceed to CD/DVD drive installation afterwards. 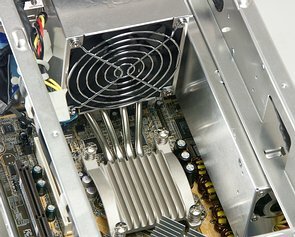 Mark the insulating padding in places where the drive cage may touch a video card and a chipset heatsink – everything is well thought-out and requires no meddling during installation. Access to the 5-inch bay from within allows to align the extension mechanism of the eject button, if the corresponding button on the faceplate of a CD/DVD drive is not in its standard place. G5 PC case marks the long-awaited break-through in the internal arrangement of barebones from Shuttle: at last we are delivered from the tangle of wires and cables! Interface connectors for the front panel are cleverly placed on the front edge of the PCB now, and the S/PDIF-Out, audio ins and the CPU cooler header – at the rear edge. Power cables (and even interface ones, if necessary) are neatly laid along the case racks with the help of holes in the racks and clips from the bundle. As a result, nothing blocks access to functional elements and vent holes – hip-hip-hurrah! We've been waiting for it so long from this barebone-building leader. 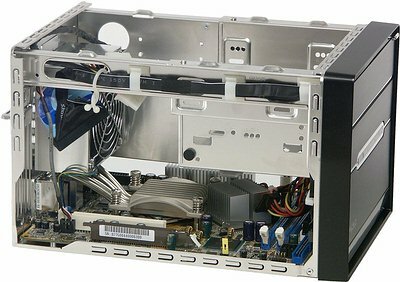 On the whole, the successful (in our opinion) appearance of the G5 PC case is supplemented by the excellent internal arrangement, which offers nothing principally new but finally allows to get rid of disadvantages of old Shuttle G/G2/G4 series. SB77G5 is based on the Shuttle FB77 motherboard on Intel 875P + ICH5R, but intended for Socket 775 processors. This chipset used to be unrivaled in performance only a year ago (the only exception was the overclocked i865PE), but the "regular" platform for Socket 775 (i915/925 chipsets) offers no less performance but possesses a set of features, which are very interesting for users. 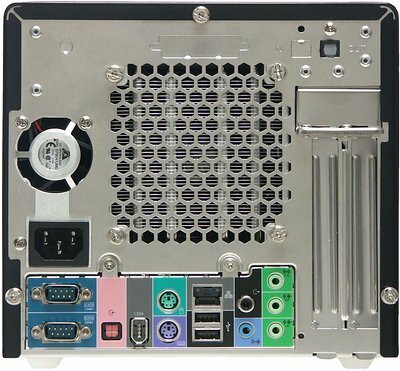 The i875P has two advantages in this field: the support for AGP video cards (the currently existing solutions with PCI Express provide only a PCIEx16 graphics slot) and a price. 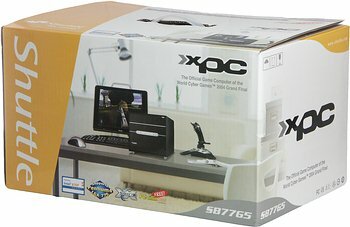 The former factor seems of little importance: unlike a user who's upgrading his or her desktop computer, it doesn't matter to a buyer of a new system (they are the majority of those who have chosen Shuttle XPC) a video card with what interface to buy – AGP and PCIE modifications have approximately the same price. The overall price of the system also levels down the lower price of the i875P relative to the i9xx. Besides, the i875P lacks integrated graphics, which will not disappoint gamers, but the others will have to waste money on a video card, which would have been not necessary otherwise (if you remember the level of 3D performance offered by i915G, part of gamers could have been quite content with such integrated video). Going back to the features of the motherboard, let's briefly enumerate its characteristics provided by the chipset: support for Intel Pentium 4, Pentium 4 Extreme Edition and Celeron D (Socket 775), up to 2 GB of DDR266/333/400 RAM (the motherboard has only 2 DIMM slots) capable of operating in dual-channel mode, AGP 8x bus for external video accelerators, two SATA ports supporting RAID 0 and 1, two UATA133 channels for 4 devices, 8 USB 2.0 ports and 6-channel audio (Realtek ALC650 AC'97-codec). At the time the article was published, the SB77G5 was announced to support all currently existing processors with 533/800 MHz bus. Besides, this motherboard contains a VIA VT6307 controller, which provides two FireWire ports, and Broadcom BCM5788KFB network adapter (10/100/1000 Mbit/sec Gigabit Ethernet). 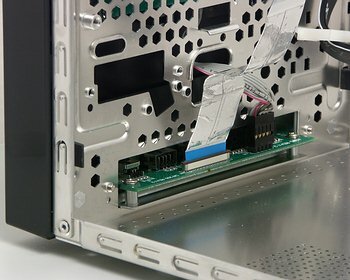 There is one AGP and one PCI slot (a standard solution for Shuttle and Soltek barebones), and the AGP slot is closer to the board edge, which excludes video accelerators with bulky cooling systems. 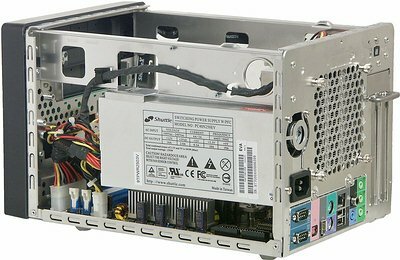 As the PCI slot is under the drive cage, it can accommodate a card no longer than 13 cm or a low-profile one. 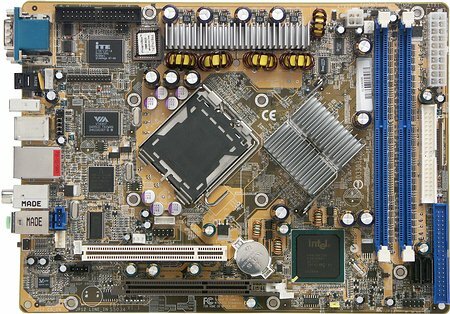 The board has an IrDA port to connect standard devices, audio CD-In and AUX-In, as well as three fan headers. 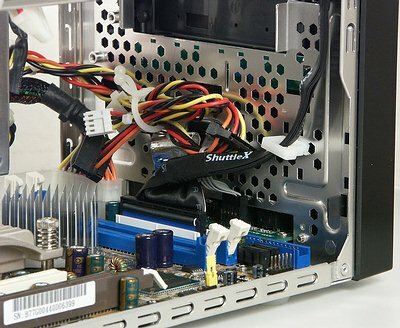 Shuttle FB77 offers decent overclocking features, which is common among modern barebones. BIOS Setup allows to increase FSB frequency to 355 MHz at 1 MHz steps, to raise AGP and memory voltage to 2.9 and 1.8 V correspondingly at 0.1 V steps, to modify CPU voltage from 0.825 to 1.5875 V at 0.0125 V steps, as well as to control timing settings and fix PCI/AGP/SATA bus frequencies at normal or increased values. Theoretically, the powerful supply unit and good 4-phase voltage regulator of the processor allow to count on successful overclocking. The only jumper on the board resets CMOS. However the mentioned button on the rear panel will surely allow to do it with more convenience. 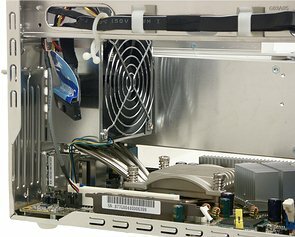 Shuttle is true to itself and we still see one cooling device and a half in the XPC: CPU and general-system ICE cooler and a Silent X power supply unit. 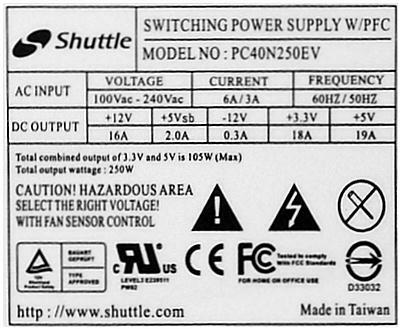 Silent X is a recent series of power supply units in Shuttle, which is notable for increased capacity and improved cooling at a moderate noise level. It should be noted that 250 W is far from a record these days (for example, Soltek uses 300 W power supply units), but we had no problems with it in our tests, though we imitated the maximum possible system load (3D games + copying data from DVD). 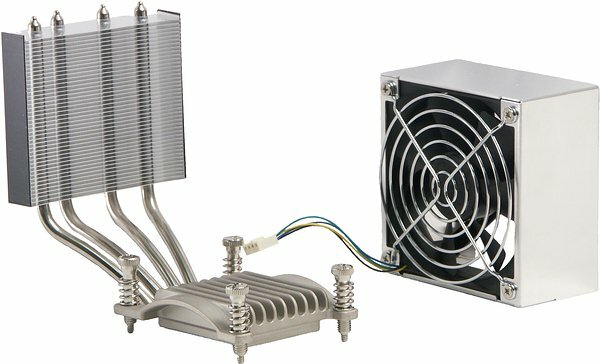 The power supply unit has a fan at each face, which provides better air flow though its innards as well as improves cooling of the front area of the barebone. The fans used are from respectable Delta (EFB0412MD: 40x40x20 mm, 7.17 CFM, 24 dBA), very quiet, with automatic rpm control. 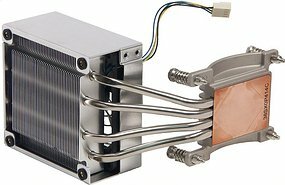 As the northbridge of the chipset and field-effect transistors in the power supply circuit of the processor are covered only with heatsinks, there are no other noise sources in the system. The power supply unit has two SATA power connectors. What concerns a floppy drive, you'll have to use a bundled power converter, because the modern power supply unit has no such connector. The maximum fan speed is ~3800 rpm, but as in all other Shuttle XPC models, the SB77G5 BIOS incorporates an automatic rpm control technology – Smart Fan. You can choose one of three operating modes: always maximum rpm (you can control it later with Windows utilities – but SpeedFan did not cope with it); speed it up it to maximum at 75°C, but keep it at ~900 rpm on other cases (Ultra-Low mode), ~1550 rpm (Low mode) or ~2250 rpm (Mid mode); or Smart Fan. In the last, the most interesting and frequently used case, the rotational speed changes automatically stepwise: before the critical temperature specified in BIOS is reached (within 25–75°C) the rpm is minimal (~950 rpm), but each degree above the critical limit increases the rpm in the specified manner (by 100-200 rpm). The system possesses enough sluggishness not to change rpm constantly (±1°C in cycle). Besides, the audible differences between the neighbouring modes are minimal. We have carried out all the tests in Smart Fan mode, the temperature threshold was set by default to 60°C. The system was assembled to maximum: Pentium 4 Extreme Edition 3.4 GHz, ATI Radeon 9800XT, sound card, 7200 rpm HDD, DVD drive, floppy drive. The temperature in idle mode was measured in 20 minutes of idleness after Windows startup, the full load mode was provided by FarCry at high resolution together with Folding@Home client calculations. We decided that DVD recording added to the task list would be too artificial. Inconsiderable temperature difference between polar modes illustrates well the work of Smart Fan: if the temperature is within admissible limits, the noise level should be reduced instead of the temperature. Though all old Intel processors cannot reduce their clock/voltage in idle mode (see our articles in the CPU section) unlike their modern successors or AMD Athlon 64/FX, Smart Fan functions should satisfy PC users. An improved ICE cooler together with well thought-out cooling solution (Smart Fan) have led to Shuttle SB77G5 being one of the best models on the market by its subjective noise level. 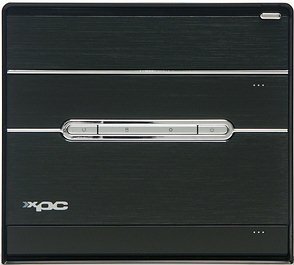 It noticeably outscores both the older XPC models as well as the competing products (before this review we named Soltek Qbic with its IcyQ cooling system to be the model). The praise is deserved not by characteristics in some certain conditions but by the constant optimal thermal conditions at minimum necessary fan activities and correspondingly minimum noise. Note that the ICE fan does not have to rotate faster than ~1600 rpm, so the maximum cooler modes in BIOS are somewhat surprising. The list of available additional accessories for barebones from Shuttle is impressive, but the standard bundle is very moderate. However, you cannot say that the manufacturer saves on something – it's just you won't find anything extra in the box, even considering the high price for Shuttle barebones. I repeat that all necessary accessories, like cable clips, a strip of insulation mylar to fix the cables on case racks, screws, thermal paste – everything is included. In conclusion we provide a brief specification of the barebone, which comes shipped in a nice cardboard box with a handle. Bays: 1 x internal and 1 x external 3.5", 1 x external 5,25"
In comparison with Foxconn 865PE7AF-8EKS based on Intel 865PE, which is also designed for Socket 775 processors, the Shuttle barebone under review is a worthy representative of its chipset. Just a year ago it used to be the performance leader (and it's not far behind the leaders even now). The archiving performance depends heavily on memory latency – the i875P with PAT looks excellent here against a "regular" i865PE, outscoring its competitor by up to 10%. However, not all applications are so sensitive to memory system performance – MPEG4 encoding is an example of tasks, which mostly depend on CPU clock and architecture. Shuttle FB77 does not manage to break away from its competitor even in the lowest game modes, so both tested systems look identical in terms of gaming. But the key point here is the lack of slow downs in the Shuttle barebone, because these two systems are not direct competitors anyway. SB77G5 has no integrated video, so the suitability of its integrated video for games is out of the question. 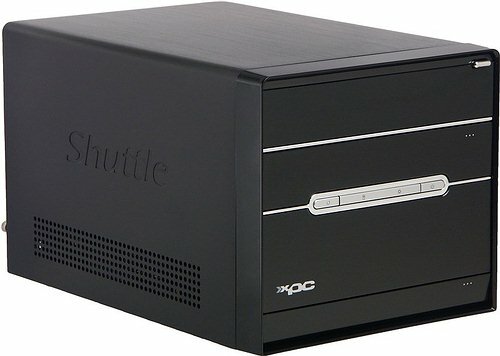 Shuttle XPC SB77G5 is put into a new good (in our opinion) PC case, it retains the quality of barebones from this company and is intended for processors, which can provide the top performance level. The price of the kit is traditionally high, but thousands of buyers all over the world have chosen Shuttle minicomputers and hardly regret their choice. The model we've reviewed today is no less worthy of your money. SB77G5 is notable for its excellent efficiency of the cooling system, which provides the record low noise level at moderate temperature conditions for this nice and fast barebone. In conclusion we'll publish a short list of the most typical pros and cons of the barebone under review. This model on the official site of the manufacturer.